Everyone knows or has heard of what tides are however; only few know how these emerge or funktion. The Sun’s and the Moon’s gravity create sort of 2 ‘water mountains’ on each side of the earth. As the water is being attracted by the moon creating a ‘water mountain’, through the gravity of the earth there also emerges a ‘water mountain’ on the other side of the earth. So in 24h the earth rotates once through these 2 ‘water mountains’. Because of this we get 2 x high tide and 2x low tide in a day. Within a month, one can often recognise extreme changes in tides. 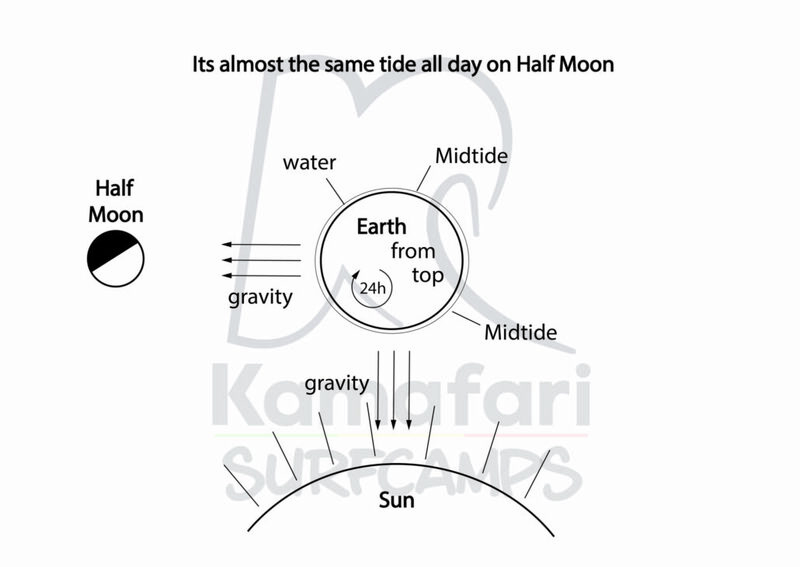 The force of tides is influenced by the position of the Sun and the Moon. 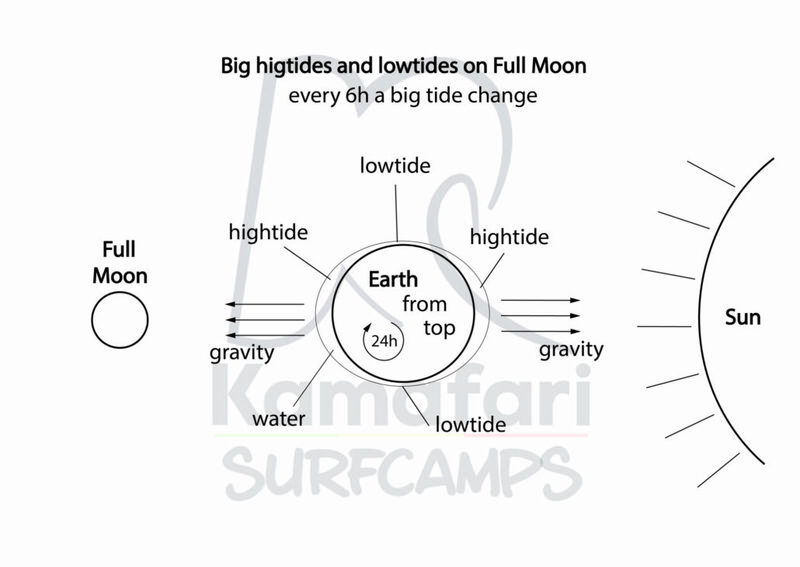 The biggest tide differences happen 2-4 days after a Full Moon and New Moon. During Half Moon, the tide difference is only very little. During Full and New Moon, the gravities of the Sun and the Moon are added together. During Half Moon they are cancelling each other out. The Earth rotates around its own axes once within 24h. As mentioned above, therefore 2 times a day underneath a ‘water mountain’. Because the Moon also rotates on its own orbit, hence is moving positions, the tides shift daily about 50 minutes. How Does a Tide Move? The biggest movement of water occurs around 3-4 hours into a tide. A Half-Tide (from high tide to low tide) lasts 6 hours. A Full-Tide (from high tide to high tide) 12 hours accordingly. 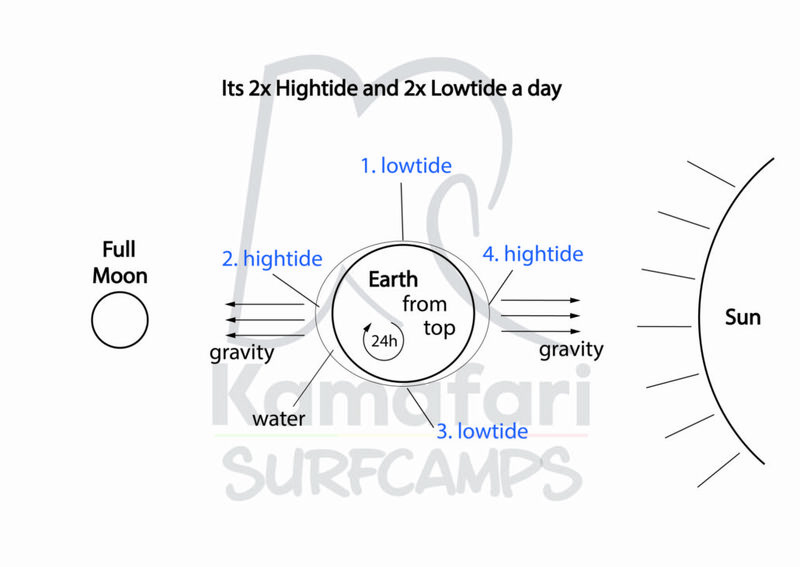 If you want to go surfing at high tide or surf a spot which functions best with the higher tide, it is recommended to be at the spot about 2h before high tide, hence there can be a window of 4 hours. Every surf spot has its own dependency on the tides. Some spots have pumping waves during high tide, some with the low tide and some other again function best with the mid-tide or tide incoming. Here experience and some knowledge of the location and surroundings will help you to score a spot at its best. So if you are starting out surfing, we recommend that you hang in surfcamps as often as possible due to its professional support and knowledge. You can obtain the maximum surf experience and gain more and experience yourself. You can apply your newly acquired Surf Theorie knowledge straight away in one of our Surfcamps. this on Facebook. Many thanks again for a great post!